For some reason, I've always been fascinated with recipes using plain beans and whole grains that are soaked and ground and used to make delicious, simple and healthful breakfast treats, breads and snacks. We need more recipes like this under our belts, so to speak, to get through hard financial times in good health and spirits. These two recipes come from very different cooking traditions (one ancient and the other more recent) that have used soaked beans and grains to advantage over the years-- Indian cuisine and Seventh Day Adventist cooking. This last weekend I had occasion to serve a recipe from each tradition. My stepson and his girlfriend were visiting and Laurie mentioned that a buddy of his (in Vancouver) wanted him to try a dosa restaurant. 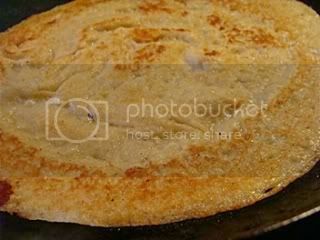 Dosai are Indian crepes made from soaked grain (usually semolina or rice) and dried legumes. 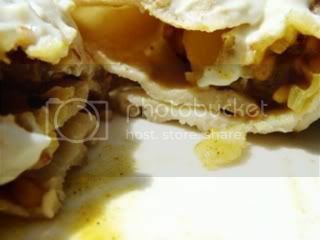 Sometime these crepes have different names, such as adai. He had never tasted them, so (being a fan of dosas) I thought I'd make some while they were here. And, as it happened, I already had some white beans soaking for waffles, so we had those for breakfast the following day, and the adai/dosai for brunch the next day. I used to make this type of dosa years ago for my children for breakfast. They loved it and I still do! 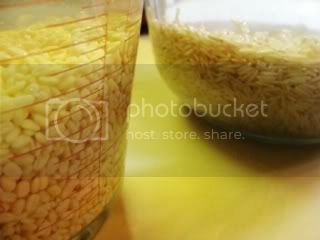 Soak the dal in one bowl with plenty of water, and the rice in another bowl with plenty of water. Soak them until the evening. 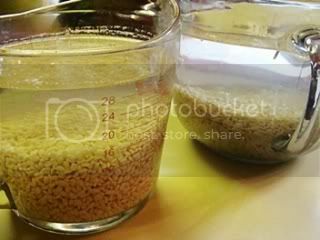 Before bedtime, drain the rice and the dal and place in a large blender or VitaMix with the salt and water. Blend until smooth. 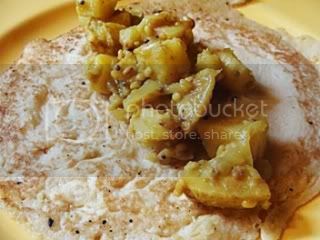 The day you are making the crepes, make or assemble your filling(s) and toppings before starting to cook the adai. Spray an 8 to 10" well-seasoned cast iron or anodized aluminum or nonstick skillet well with oil from a pump sprayer and heat over high heat. When cold water sprinkled on the pan sizzles, scoop about 1/3 cup of batter into the center of the pan with a small ladle and then use the bottom of the ladle to go in circles and spread the batter out from the center. It's easier than you might think! 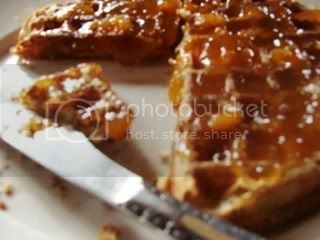 See the "action" pictures here from a similar recipe (grain-free). 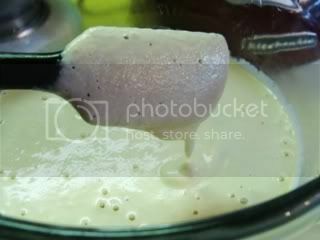 PS: If your batter doesn't spread easily, it may be too thick—cautiously stir in a little more water. 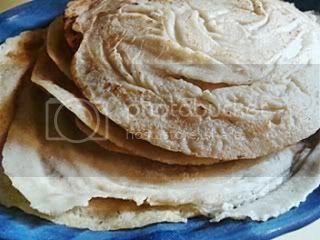 Carefully turn the adai and cook for a few seconds, then lay on a platter with a clean tea towel over them (you can fold them in half if you like). 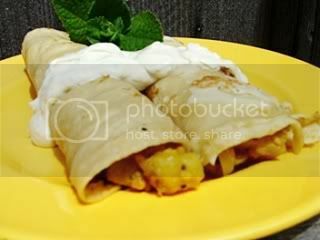 Place some filling (in this case Masala Potatoes, see recipe below) down the middle of each adai and roll up. 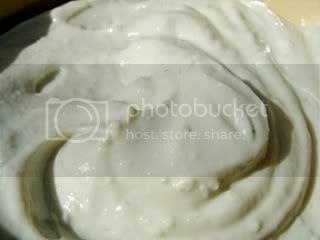 Serve with the Lime Tofu Yogurt (see NOTE below) and any hot sauces and/or chutneys you like. 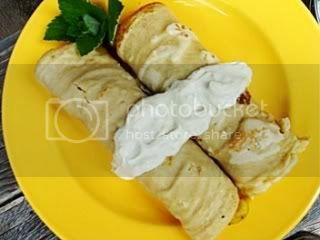 NOTE: For the Lime Tofu Yogurt, use this recipe, but use 3 tablespoons fresh lime juice and 1 tablespoon lemon juice (instead of 1/4 cup lemon juice) , plus the finely-grated zest of 1 medium organic lime. 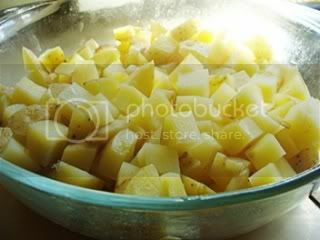 Steam the potato cubes until just tender OR (the way I prefer because it saves time and electricity), place the cubes in a microwave-safe casserole with 2 tablespoons water, cover and cook on high for about 8 minutes, or until tender. 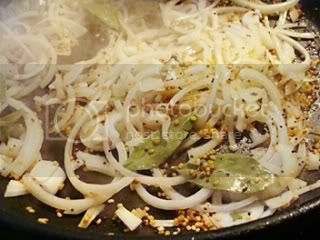 Heat the oil in a large well-seasoned or nonstick skillet over medium-high heat. Add the mustard seeds. When they pop, add the onions, curry leaves, turmeric, coriander, cayenne and salt. Stir-fry, adding a small splash of water as needed to keep things moving, until the onions are nicely wilted. Add the potatoes and water, cover and cook on low heat for about 5 minutes. Add the lemon or lime juice and serve. Sweet post! I've been waiting for a dosai recipe. Can't wait to try it. Made this tonight and it was absolutely delish! Thanks for the recipe!